Our house has been transformed this week with the creation of a pretend play post office. 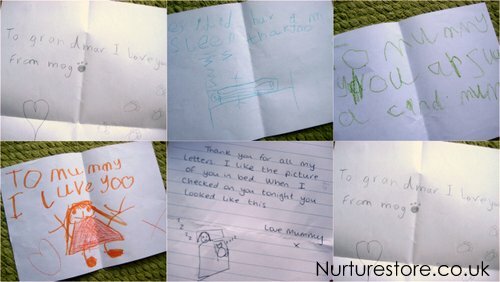 Children who used to run off into the garden at the sight of a pencil and piece of paper are getting up early to check their mail and write replies. 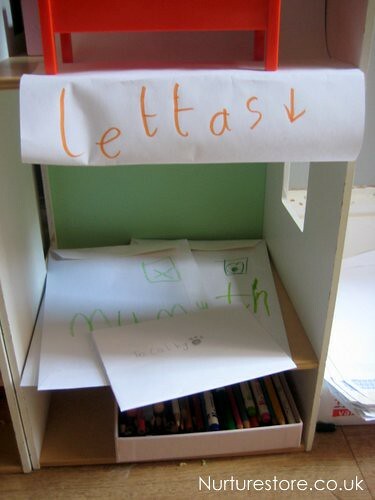 Everyone is excited to find mail waiting for them outside their bedroom door when they wake up in the morning and lots of kind wishes are being expressed between siblings in their correspondence. The children are putting in plenty of writing practice too of course and learning the value of letters – making their mark with a practical purpose and having lots of fun as they learn. You need a post box. A fancy one. Any box will do but make it the right size to fit whichever envelopes you plan on using. Cut a door at the back so you can easily get at all the letters inside. Provide lots of writing supplies. You can make writing irresistible by offering a selection of writing paper in different sizes and colours. Picklebums has some great free printable notecards you could use. The kids I know just love ‘grown up’ stationery donated from daddy’s office supplies. Appoint a postman for the day. This is a prized job in our house as the post man (or woman) has overall responsibility for checking the postbox, putting wiggly lines on the stamps and then going on their rounds to deliver the letters to all the correct bedrooms. This activity is all about fun and using writing for a practical purpose. It doesn’t matter if the children write letters the wrong way round, spell things incorrectly or squash all the words in one part of the paper. 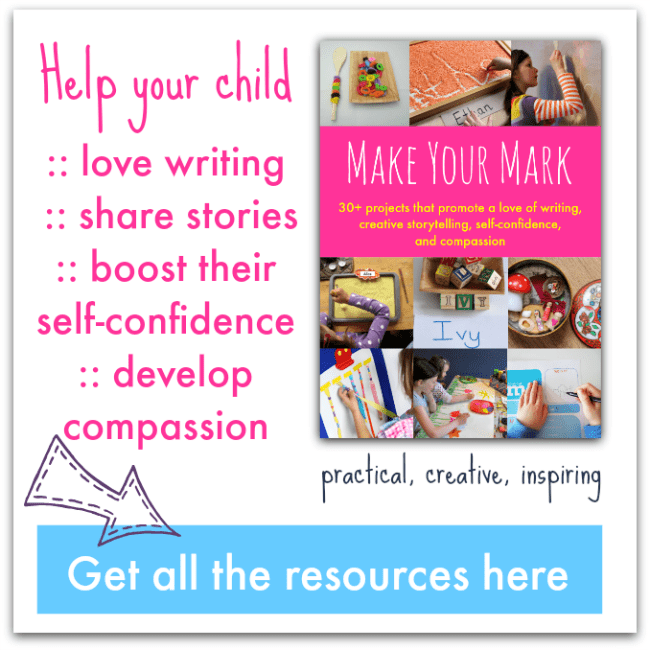 Celebrate the fact that your children are communicating, their way. Having said that, make sure you reply and model how a conventional note is set out. Reply to all letters you receive and ask questions to encourage the children to write another letter back to you. 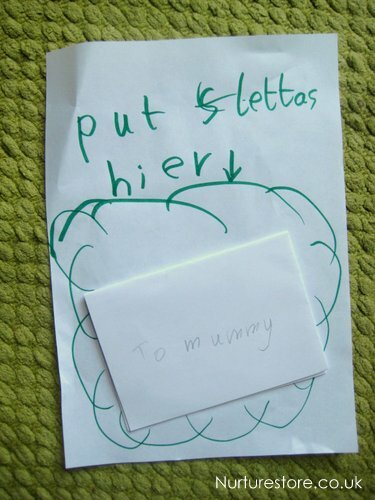 Getting ten letters saying ‘mummy I luve yoo’ is of course delightful but you can include a prompt in your reply to get the children to extend their correspondence. You might ask: what did you dream about last night? what was a funny thing that happened to you today? 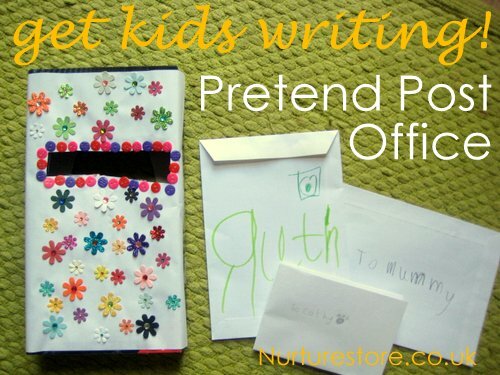 Your children could also have their teddies or imaginary friends write some of the letters, giving them the chance to stretch their imaginations. What would Big Ted write? Use your own letters to connect with your children. I bet you check on your kids each night before you go to bed. Do you whisper a blessing to them or say a prayer for them? Or maybe think about that special sweet thing they did today. Or wonder how you will help them tackle a particular problem tomorrow. 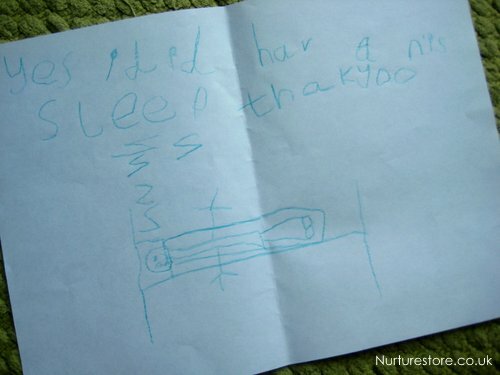 Put that in your letter and share those wishes and blessings with your child in a note they can read when they wake. Oh we LOVE playing post offices here! We once made our own individual letter boxes and I’ve created prinable letter writing kits too (details for all of them on my blog). I think we’ll set one up again for our winter break next week, thanks for the reminder and some great new ideas! Great tips! I love how you assign a postman for the day!